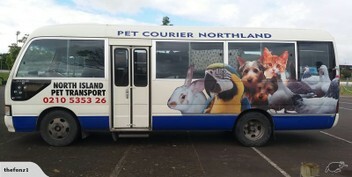 Air-condit­ioned transport with care, Northland to Invercargi­ll combined with PETBUS. 2nd Run mid-month North Island only Route depends on bookings. Monthly for North to South Island. OTHER RUNS ON REQUEST. We Transport animals with care, by road, all animals we take on-board are catered for with 24hr care. We travel with them, tend to their needs on the way. We guarantee their safe journey to their new homes. Professional, Stress-Free, air-conditioned transport for all domestic Pets, small farm animals and Working Dogs. We take Pets by road, we travel with them. We take them from seller to new owner within New Zealand with 24hr Care. Runs start in Ohaeawai and finish in Whangarei.